Juan Apodaca (Aguilas del Zulia) went 0 for 2 in one appearance. Leandro Marin (Leones del Caracas) was roughed up in his lone appearance of the week, going 0.2 innings allowing 4 runs on 4 hits while taking the loss. Enrique Gonzalez (Tiburones de La Guaira) made 2 starts during the week, picking up a win on November 24. In total, he pitched 10.0 innings, allowing 15 hits and 6 earned runs while striking out 6 and walking 2. Yeiper Castillo (Aguilas del Zulia) made 2 appearances out of the bullpen, picking up 2 wins in his 3.2 innings of work while allowing only 1 hit. Robert Coello (Algodoneros de Guasave) made 2 starts, also picking up the win on November 24. He pitched 13.0 innings total, allowing 8 hits, 3 runs, and 2 walks. He struck out 7. Reynaldo Rodriguez (Leones de Monteria) went 3 for 14 with a double in five games. Aaron Bates (Criollos de Caguas) 2 for 7 with a home run, 4 RBI and 3 runs scored across two games. Reymond Fuentes (Gigantes del Carolina) went 2 for 11 with an RBI and a run scored in three games. Iggy Suarez (Leones de Ponce) went 5 for 13 in five games with 3 RBI and 2 runs scored. Kenneth Roque (Leones de Ponce) was 0 for 1 with a run scored in two games. Jose Vaquedano (Leones de Ponce) made 2 relief appearances, going 1.1 innings total and allowing 2 walks while recording a strikeout. Player of the Week: Yeiper Castillo, who was dominant in 2 relief appearances, picking up 2 wins and only allowing 1 hit in his 3.2 innings of work. According to Cleveland.com, Torey Lovullo, the manager for the Triple-A Columbus Clippers in the Cleveland Indians system, will become the next manager of the Pawtucket Red Sox. Lovullo has spent the past four seasons as the manager of the Triple-A affiliate for Cleveland, starting when the team was the Buffalo Bisons in 2006 and continuing as the team moved to Columbus following the 2008 season. He began his coaching career in the Cleveland system in 2001 as a roving instructor and won back-to-back manager of the year awards with High-A Kinston and Double-A Akron in 2004 and 2005. He was originally drafted by the Detroit Tigers in the 1987 amateur draft, playing in parts of eight Major League seasons with the Tigers, Yankees, Angels, Mariners, Athletics, Indians and Phillies. He posted a career Major League line of .224/.301/.335, and also won back-to-back championships with the Buffalo Bisons as a player in 1997-1998, being named playoff MVP both seasons. The Red Sox have acquired infielder Tug Hulett from the Kansas City Royals in exchange for a player to be named later or cash considerations. Hulett, originally drafted in the fourteenth round of the 2004 amateur draft by Texas, spent parts of four seasons with the Rangers organization before being traded to Seattle for Ben Broussard. He made his major league debut with Seattle in 2008 and hit .224/.309/.306 in 30 major league games that season. Hulett appeared in 15 games with Kansas City last year, hitting .111/.158/.111 in 18 at-bats. He is a career .284 hitter in parts of six minor league seasons with a .393 on-base percentage. Last season with the Triple-A Omaha Royals, Hulett hit .291/.384/.473 with 11 home runs and 9 steals in 99 games. The SoxProspects rankings received a little bit of a shake-up today, particularly towards the top. Ryan Westmoreland jumped up to the second spot, switching spots with Josh Reddick, who slides down to four. Reddick and Ryan Kalish continue to run neck-and-neck as the top outfielder in the higher levels, with Kalish barely edging out Reddick this time around. Anthony Rizzo also moved up two spots to sixth. Looking on down the line, Derrik Gibson, Dustin Richardson, Tim Federowicz, and Mark Wagner also jumped up into the top twenty. Most of the rankings changes can be attributed to updated scouting report information we’ve received through conversations with the Sox front office, expert scouts, and other baseball professionals. For example, we continue to receive glowing reviews of Westmoreland, which has only reinforced are previous evaluations of his potential. Similarly, the positive reports on Rizzo – particularly his defense – have persisted throughout the off-season. Some of the rankings adjustments are also attributable to fall and winter league performance. In those cases, the evaluations are based far more on recent scouting evaluations than those players’ small sample size statistical performances. For instance, reports on Richardson’s fastball in the Arizona Fall League have been impressive, while he put up an inconsistent statistical performance for Mesa this fall. Next season, look for weekly Rankings Reports on the SoxProspects rankings adjustments. The Red Sox have set their Major League coaching staff for the 2010 season. Demarlo Hale, who has served as the Red Sox third base coach the past four seasons, will be the club's new bench coach, taking over a role vacated by Brad Mills, who was named manager of the Houston Astros. Former Pawtucket manager Ron Johnson will become the team's first base coach, and current first base coach Tim Bogar will become the team's third base coach. Rob Leary, who has spent the past seven seasons as the organization's minor league field coordinator, will be added as a Major League coaching staff assistant. Hale played parts of four seasons with the Red Sox and Athletics organizations between 1984 and 1988. He began his coaching career in 1993 as manager of Class-A Fort Lauderdale in the Boston system. He also served as manager of Sarasota, Trenton and Michigan teams in the Red Sox organization, and was named manager of the year in 1996 with Michigan. Hale also managed in the Texas organization, guiding the Triple-A Oklahoma Red Hawks in 2000 and 2001, and served as the Rangers third base coach and as an outfield instructor before becoming the Red Sox third base coach in 2006. Johnson played briefly for the Royals and Expos organizations between 1982 and 1984 before beginning his managerial career with the Kansas City organization, taking the helm for the Class-A Baseball City Royals in 1992. He spent six seasons in the Kansas City organization, also managing Double-A Witchita and Triple-A Omaha. Johnson joined the Red Sox organization in 2000, spending two seasons as manager of the Class-A Sarasota Red Sox. He served as manager of Double-A Trenton from 2002-2004 before spending the past five seasons as manager of the Triple-A Pawtucket Red Sox. Bogar played parts of nine major league seasons with the Mets, Astros and Dodgers organizations, hitting .228. Bogar managed the Greenville Astros in 2004 and the Lexington Legends in 2005 while with the Houston organization. He moved to the Indians organization in 2006, spending two seasons as the manager of the Double-A Akron Aeros. He was named Eastern League Manager of the Year for 2006. Bogar joined the Red Sox coaching staff last season as first base coach. Leary's duties, per a Red Sox press release, will include "organizing Spring Training workouts, helping the coaching staff in all pre-game on-field preparations, assisting in the advance scouting effort, as well as completing special in-game assignments as delegated by Manager Terry Francona." 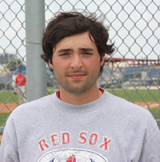 Leary is entering his ninth season with the Red Sox, the prior seven as the club's roving minor league field coordinator after spending one year as the Sox' minor league catching instructor. He spent the prior seven seasons with the Florida Marlins in various roles - advance scout, director of field operations, minor league field coordinator and catching instructor. As a player, Leary spent five seasons in the minors after being drafted by the Expos in 1986, serving as a player/coach for Single-A Rockford in his final season on the field in 1990. He managed Rockford for two more seasons after retiring as a player, then managed Single-A West Palm Beach for two more from 1993-1994. Luis Exposito: After finishing strong for Double-A Portland in 2009, expectations for Exposito were high as the AFL season began. With a strong .314/.364/.431 line and only 7 strikeouts in 51 at-bats, the 22-year-old catcher did what he had to do to meet those expectations. Exposito made 14 starts behind the plate for Mesa, collecting 3 doubles, 1 home run and 4 RBI in the process. His .314 batting average was good for fourth on the Solar Sox roster, and he hit .333 against left-handed pitching. Boston's thirty-first-round pick in the 2005 draft, Exposito is currently SoxProspects.com's eleventh-ranked Red Sox prospect. 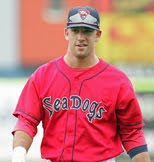 Ryan Kalish: Like Exposito, Kalish had a strong 2009 for the Portland Sea Dogs. Also like Exposito, Kalish enjoyed a strong AFL season for the Mesa Solar Sox. Playing all three outfield positions, Kalish hit .301/.384/.384 with 3 doubles and 1 home run. His 15 RBI, buoyed by a .417 batting average with runners in scoring position, were good for second on the team, as were his 6 stolen bases, while his 10 walks in 73 at-bats were third on the team. The 21-year-old also struck out 22 times, however, good for third on the Solar Sox as well. His 14 runs scored ranked him fourth. Kalish joined the organization as a ninth-round pick in the 2006 draft. He is the third-ranked prospect in the organization by SoxProspects.com. Casey Kelly: While Kelly may be one of the top-rated prospects in the Red Sox organization as a pitcher, his showing in the AFL as a hitter left much to be desired. In 41 at-bats spread over 11 games played, Kelly hit just .171/.261/.244, striking out 17 times. His .244 slugging percentage and .505 OPS were both worst on the Mesa roster, while his .171 batting average would have ranked worst in the league had he accumulated enough at-bats to qualify. On a more positive note, Kelly did walk in 10.8% of his plate appearances, ranking him fifth on the team, and he did hit a respectable .286/.318/.429 with runners on base. The top-ranked prospect in the organization by SoxPropsects.com was a first-round pick in 2008. Jose Iglesias: Making his first professional appearance since signing with the Red Sox out of Cuba in September, the 19-year-old shortstop more than held his own. Iglesias hit .275/.324/.420 in 69 at-bats for Mesa, including 4 doubles, 2 home runs, 12 RBI and only 11 strikeouts. The right-handed infielder performed similarly against right-handed and left-handed pitching, batting .276 and .273, respectively. However, the story on Iglesias is his prowess in the field, and scouting reports were unanimously glowing about his quick hands and fluid movements at short. Iglesias, who took part in the AFL's Rising Stars Game, is currently the tenth-ranked prospect in the Red Sox system by SoxProspects.com. Randor Bierd: After working primarily as a relief pitcher for Triple-A Pawtucket in 2009, Bierd came to the AFL to work as a starter, as he had in the latter part of the regular season. The 25-year-old right-hander made 7 starts for Mesa covering 25.1 innings, both team highs. He ended up 3-2 with a 6.04 ERA, striking out 17 and walking 12. Of the 25 hits Bierd allowed, only one was a home run. Acquired by Boston from Baltimore in exchange for David Pauley in January, Bierd is rated fifth amongst post-prospects in the Red Sox organization by SoxProspects.com. Richie Lentz: In 2008, Lentz put up a marvelous campaign for Lancaster and Portland, pitching to a 3.14 ERA and striking out 112 batters in 77.1 innings. Things did not go so well for him in 2009, however, as the hard-throwing right-hander struggled to a 5.98 in 49.2 innings, striking out 74 but walking 39 while battling a loss of command and injuries. Needless to say, Lentz and the Red Sox hoped that he could rediscover his effectiveness in the AFL, and in many ways he did. Lentz went 1-0 with 3 holds and a 4.11 ERA in 10 games, striking out 16 and walking only 3 in 15.1 innings while holding opposing hitters to a .224 batting average. His 5.33 strikeout-to-walk ratio ranked third on the Solar Sox roster, while his 1.04 WHIP was second. The 25-year-old Lentz, a nineteenth-round pick in 2006, is presently the forty-third-ranked prospect in the organization by SoxProspects.com. Chris Province: A fourth-round pick in the 2007 Draft, Province posted a stellar 2.60 ERA for Portland in 2009. The 24-year-old right-hander did nearly as well for Mesa in the AFL, pitching to a 3.46 ERA with 2 saves in 13.0 innings. Province allowed only 9 hits, limiting opposing hitters to a .200 batting average, while his 1.08 WHIP was third on the team. He was most effective against left-handed hitters, holding them to a .172 batting average in 8.2 innings, and he also did well when runners were in scoring position, holding hitters to a .100 batting average in those situations. Province is SoxProspects.com's forty-seventh rated Red Sox prospect. Dustin Richardson: For Richardson, 2009 brought a world of change, as the tall left-hander transitioned to a bullpen role after a challenging 2008 campaign as a starter. Richardson pitched well as a reliever, posting a 2.55 ERA with 96 strikeouts in 74.0 innings between Portland and Pawtucket, even earning a call-up to Boston to make his Major League debut. Naturally, expectations were high for Richardson in the AFL, but things didn't quite go as planned. In 11 games and 11.2 innings for Mesa, Richardson posted a 5.40 ERA, allowing 3 home runs and walking 10 en route to a 1.97 WHIP. It wasn't all bad for Richardson, though, as his 13.88 strikeouts per 9.0 innings was second on the team. 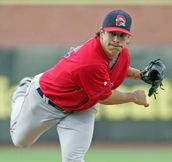 A fifth-round pick in 2006, Richardson, who also took part in the AFL's Rising Stars Game, is the twenty-third-ranked prospect in the system by SoxProspects.com. Leandro Marin (Leones del Caracas) made one appearance out of the bullpen, going 1.1 innings allowing a hit and a walk. Enrique Gonzalez (Tiburones de La Guaira) started November 18, going 4.2 innings allowing 2 runs on 6 hits (1 home run), walking 3 and striking out 4. Yeiper Castillo (Aguilas del Zulia) made 2 appearances out of the bullpen, pitching 0.2 innings allowing 2 hits, striking out 1 and walking 1. Jose Capellan (Toros del Este) made 2 starts during the week, going 0-1 in 6.1 innings pitched, allowing 3 runs on 4 hits (1 home run), walking 9 and striking out 4. Robert Coello (Algodoneros de Guasave) made a start on November 18, going 2.1 innings, allowing 3 runs on 5 hits while walking 2 and striking out 2. Angel Chavez (Caneros de los Mochis) appeared in 3 games, going 1 for 12 with 2 runs scored. Reynaldo Rodriguez (Leones de Monteria) went 6 for 19 with a triple, serving primarily as the Leones lead-off hitter. Reymond Fuentes (Gigantes del Carolina) went 1 for 5 with an RBI and a run scored in his lone appearance this week. Jorge Jimenez (Indios de Mayagüez) was 2 for 3 with a double and 2 RBI in 2 games. Iggy Suarez (Leones de Ponce) went 0 for 5 in 3 games. Kenneth Roque (Leones de Ponce) was 2 for 6 in 2 appearances. Jose Vaquedano (Leones de Ponce) made 2 relief appearances, going 0.2 innings total and allowing 2 walks while recording a strikeout. Andrew Dobies (Leones de Ponce) made 3 appearances out of the bullpen, pitching 2.0 innings and allowing 3 runs on 6 hits, striking out 2. Player of the Week: Jorge Jimenez, who stayed hot for Mayaguez, going 2 for 3 with a double and 2 RBI this week to bring his average to .400 with 1 home run and 4 RBI in his first 10 at-bats. Over the past week, we reported on players who we had believed would be eligible for the 2009 Rule 5 Draft, which is scheduled to take place on December 10. It turns out that we were incorrect on five of the players who will be eligible for this year's Rule 5 Draft, most notably Yamaico Navarro. According to a newly-discovered amendment to Rule 5, Navarro will not be eligible for the Rule 5 Draft until next year. My apologies for the confusion. Here is the reasoning for my error. The names of players who will be eligible for the Rule 5 draft are not publicly available. In fact, the text of Rule 5 itself is not publicly available, and until this week I only had a copy of the Rule as it existed in 2005. I determined Rule 5 eligibility of every player in the system using my interpretation of the complicated language of Rule 5, and our knowledge of the signing date and contract status of each player in the system (which is also not always publicly available). Because of this lack of public information, it is sometimes difficult to precisely determine the exact Rule 5 status of every player in the system. As you might remember, Rule 5 was recently amended to add another year of protection to every minor league player. At that time, Rule 5 was also amended to start the Rule 5 "clock" running from the year the player signed his first professional contract instead of the first effective year of that contract. I was told at the time that the "year" clock started running at the Rule 5 Draft itself in early December, and I updated our Rule 5 calculations accordingly (I did not have a copy of newly-amended Rule 5 at the time). I just received an actual copy of amended Rule 5. It turns out that the "year" clock actually starts to run at the end of the minor league regular season, rather than the Rule 5 Draft itself. As such, that means players who signed their original professional contracts between season end and early December actually have one more year of Rule 5 protection than we previously thought. This affects the following five players who we originally believed would be eligible for next month's draft: Ronald Bermudez, Mitch Dening, Yamaico Navarro, Chih-Hsien Chiang, and Yeiper Castillo. My apologies for the confusion. For those interested, here is the text of Rule 5(c), which outlines eligibility for the Rule 5 Draft. According to multiple sources, Pawtucket Red Sox manager Ron Johnson will be joining the Major League coaching staff in Boston. The exact position he will fill has yet to be determined. Johnson first joined the Red Sox organization in 2000 as the manager of the Class-A Sarasota Red Sox in the Florida State League after eight seasons managing in the Kansas City organization. Johnson would manage the team for two seasons before moving to the Double-A level for the next three, managing the Trenton Thunder / Portland Sea Dogs from 2002 through 2004. In 2005, Johnson took over the Pawtucket Red Sox managerial position from Buddy Bailey, guiding the team to a 357-359 record over the course of the next five seasons. Johnson's Paw Sox twice finished second in the International League's Northern Division, including setting a franchise record for wins in 2008 by going 85-58. Over the course of his 17-year managerial career in the Royals and Red Sox systems, Johnson's teams have gone 1173-1202. Johnson, 53, also played in parts of three seasons in the Major Leagues, putting up .261/.358/.304 numbers in 55 plate appearances with Kansas City and Montreal from 1982 through 1984. He also owns a career minor league line of .289/.333/.434 with in parts of eight seasons played. According to ESPN.com, the Boston Red Sox have claimed right-handed pitcher Robert Manuel off waivers from the Seattle Mariners. Manuel was originally signed as undrafted free agent by the New York Mets out of Sam Houston State in 2005. He was traded by the Mets to the Cincinati Reds in 2006 for Dave Williams. After spending parts of four seasons in the Reds' minor league system, he was traded to Seattle for Wladimir Balentien on June 29, 2009. In five minor league seasons, the 26-year-old has compiled a 24-17 record with a 2.89 ERA in 170 games pitched, including 24 starts. He has struck out 339 batters in 368.1 innings, posting a 5:1 strikeout-to-walk ratio. 11/20 Cup of Coffee: Mesa ended the season with its fourth straight loss, dropping a 8-1 decision to the Peoria Saguaros. The loss saw the Solar Sox finish last in the Arizona Fall League's Eastern Division with 13 wins, 18 losses and a tie. The Saguaros jumped off to an early lead scoring a run in the top of the first inning. Padre prospect Lance Zawadzki singled, advanced to second on a wild pitch, and scored on a Matt McBride (CLE) base hit. There was no further scoring until the sixth inning, when Zawadzki homered off Mesa reliever Tim Kiely (LAA). In the seventh, the Saguaros broke the game open scoring six times. The runs came as a result of three walks, an error and three doubles off Mesa's Marco Albano (LAA). The Solar Sox scored their only run of the game in the bottom of the ninth. Steve Singleton (MIN) doubled and advanced to third on an error by Saguaro shortstop Zawadzki. He scored when Casey Kelly grounded into a force out. Two Sox prospects took part in the game. Ryan Kalish went 1 for 4 and had a stolen base. He ended the fall campaign with a .301 batting average. Kelly went 0 for 4 with a RBI. His batting average for the fall season was .171. According to Baseball America's minor league transactions, the Red Sox have released pitchers Michael Lennox and Wang-Yi Lin and outfielders Juan Bonifacio and Roberto Feliz. Lennox (pictured) was signed in August of 2006 as an international free agent out of Australia. In two seasons with the Gulf Coast League Red Sox, he appeared in 19 games, all out of the bullpen, and compiled ERAs of 3.94 in 2008 and 3.47 in 2009. Lin was originally signed out of Taiwan as an international free agent in July of 2005. He had an impressive American debut in 2006 with the Gulf Coast League Red Sox, posting a 1.31 ERA in 20.2 innings pitched. He missed all of 2007 with an elbow injury, coming back in 2008 with the Gulf Coast League Red Sox to post a 4.63 ERA in 11 games (9 starts). The next two seasons, Lin appeared in only four games in Lowell without much success. Bonifacio was signed out of the Dominican Republic in July of 2006 as an international free agent. He spent all of the next two seasons with the Dominican Summer League Red Sox, putting up an OPS of .727 in 2007 and .845 in 2008. In 2009, he made his American debut in the Gulf Coast League, struggling to a .208 average in 30 games. Feliz was originally signed out of the Dominican Republic in November of 2005, spending his first two seasons with the Dominican Summer League team, hitting 11 home runs and posting 79 RBI across the two seasons. He made his American debut in the Gulf Coast League in 2008, showing good power with 7 home runs in only 142 at-bats. With Lowell in 2009, he hit a home run on opening day, but struggled to a .175 average in 13 games before being placed on the restricted list late in the season. 11/19 Cup of Coffee: The Solar Sox dropped their third straight contest 7-5 to Scottsdale, despite pounding out 11 hits. Mesa got out to an early 1-0 lead once again as Steve Singleton (MIN) laced an RBI single in the first, but Scottsdale answered right back when Jose Tabatha (PIT) tripled and scored on a wild pitch in the bottom half of the inning. Chris Parmelee's (MIN) RBI double in the top of the third gave Mesa a 2-1 advantage. However, Mesa would lose the lead in the bottom half of the inning when the Scorpions staged a two-out rally, capped by Brandon Crawford's (SFG) 2-RBI single and Tuffy Gosewisch's (PHI) 2-RBI double. The Solar Sox would cut the lead in the top of the sixth as Luis Exposito drove in Singleton on a ground out. But Mesa would give the run back in the bottom half of the inning as Troy Hanzawa (PHI) scored on a throwing error by Parmelee. The Solar Sox scored two runs in the top of the eighth, thanks to an RBI double by P.J. Phillips (LAA) and an RBI single by Ryan Mount (LAA), but once again, the Scorpions added an insurance run in the bottom half of the inning on Chase d'Arnaud's (PIT) RBI single to seal the victory. Exposito was 1 for 4 with an RBI. Jose Iglesias was 1 for 4 with 2 strikeouts. Dustin Richardson pitched the sixth inning, allowing 1 run on 1 hit, walking 1 and striking out 2. The Solar Sox wrap up the AFL season this afternoon at 2:35 EST against the Peoria Saguaros. 11/18 Cup of Coffee: It was the same old story for Mesa on Tuesday, as the team jumped out to a first-inning lead but quickly gave it up and went on to lose big, this time by a 9-2 score to the Surprise Rafters. The early Solar Sox lead came courtesy of three consecutive one-out singles by Starlin Castro (CHC), David Cooper (TOR), and Ryan Kalish, the last of which drove in the run to make it 1-0. Kalish promptly stole second base, his fifth theft of the AFL season, to put runners at second and third with two outs, but P. J. Phillips (LAA) grounded out to end the threat. Surprise took a lead of its own just half an inning later. Mike Moustakas (KC) opened the inning by reaching on a Casey Kelley error and Daryl Jones (STL) reached on a fielder's choice grounder that yielded no outs. One out later, Ruben Tejada (NYM) doubled and Jarrod Dyson (KC) singled, driving in all three runs against Mesa starter Andrew Cashner (CHC). The Rafters would tack on two more runs in the top of the fifth on a two-run home run by Nick Evans (NYM), but the game would be put out of reach in the seventh. After having just retired the side in order in the top of the sixth, Richie Lentz allowed a lead-off double to Dyson. After striking out Daniel Descalso (STL), Colin Curtis (NYY) lined a two-run home run to right to make the score 7-1. Another strikeout and a walk later, the home-run bug again bit Lentz, as Moustakas hit his fifth of the season to make it 9-1. Mesa would get one back in the bottom of the inning when Kelley was doubled home by Michael Brenly (CHC), but it was too little, too late. Kalish, who played right field in this one, ended up 1 for 3 with a walk, an RBI and a steal, while third baseman Kelley was 0 for 4 with 2 strikeouts. Lentz ultimately struck out 3 in his 1.2 innings, but gave up 4 runs on 3 hits (2 home runs) and a walk. Chris Province, who relieved Lentz with two outs in the seventh, pitched 1.1 scoreless innings with a strikeout. Mesa travels to Scottsdale to take on the Scorpions tonight at 8:35 EST. With the deadline to add players to the 40-man roster and protect them from the Rule 5 Draft rapidly approaching, the Red Sox today made another move to clear space, releasing catcher George Kottaras. Kottaras, 26, appeared in 45 games with Boston in 2009, serving primarily as the early-season back-up to Jason Varitek and the personal catcher for Tim Wakefield. He was placed on the disabled list on August 1 to make room on the active roster for Victor Martinez and was called up again when rosters expanded in September, but played sparingly after that. On the season, Kottaras compiled a .237/.308/.387 line in 104 major league plate appearances. Of his 22 hits in 2009, more than half went for extra bases (11 doubles, 1 home run). Originally a twentieth-round pick in 2002 by San Diego, Kottaras came to the Red Sox organization in a trade for David Wells in August, 2006. He hit 22 home runs in 2008 for Pawtucket, when he also drove in 65 runs and led the team with 64 walks. Over the course of his seven minor league seasons within the Padres and Red Sox systems, Kottaras hit a combined .269/.367/.444 with 134 doubles and 66 home runs in 2274 plate appearances. November 18 update: Kottaras asked for his release so he could pursue opportunities with other teams, and the Red Sox obliged. Boston’s 40-man roster presently has thirty three players on it (including potential free agent Alex Gonzalez), leaving seven to eight open roster spots. Don’t expect all those spots to get filled – the Sox always leave a lot of breathing room for upcoming off-season acquisitions. Look for three or four players to be added on November 20. The primary candidates are shortstop Yamaico Navarro (pictured), pitcher Richie Lentz, and third baseman Jorge Jimenez. Each of these players ended the 2009 season in Double-A Portland, and each could potentially see some playing time with Boston in 2010, especially if they're added to the 40-man this off-season. Navarro, the twelfth-ranked prospect in the system by SoxProspects.com, missed the first two months of the 2009 season with a hand injury. He then played in 23 games at High-A Salem, hitting .319/.373/.543, before earning a promotion to Portland in late July. 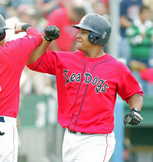 The 22-year-old struggled offensively in 39 games for the Sea Dogs, hitting just .185/.270/.304. While Navarro has the potential to be a starting infielder at the major league level down the line, he currently projects more as a long-term reliable bench option. He’s also a candidate to slide over to third base in 2010 to make room for Jose Iglesias. In brief playing time this winter for Licey in the Dominican Winter League, Navarro is hitting .125 in six games. Lentz, 25, is another player who struggled in 2009, putting up a 6.75 ERA for the Sea Dogs in 29 appearances out of the bullpen. He also struggled with control, walking almost a batter an inning, but that has largely been attributed to a shoulder injury that lingered throughout the season. All that being said, the flame-throwing righthander leads the organization with 11.6 strikeouts per nine innings over the last three seasons. He has also bounced back nicely this fall, going 1-0 with a 1.98 ERA, 13 strikeouts, and just 2 walks in 13.2 innings for Mesa in the Arizona Fall League. He’s presently the forty-fifth-ranked prospect in the system by SoxProspects.com. Jimenez has been voted the SoxProspects.com All Star at third base for three years running. He was also named the Sea Dogs’ Most Valuable Player in 2009 after a year in which he hit .289/.366/.424 with 13 home runs. Look for the 25-year-old to compete for the starting third base spot for Pawtucket in 2010. While Jimenez has shown success offensively at nearly every level since being drafted in the fifteenth round in 2006, his defense has been called into question, leaving his potential as a major league backup corner infielder in doubt. Additionally, until he picks up a little more power, his bat doesn’t profile as a starting major league third baseman. In the end, the Sox may not want to risk losing him in the Rule 5 Draft, so he’s a strong candidate for protection this year. Jimenez, the twenty-eighth-ranked prospect in the system by SoxProspects.com, is presently playing for Mayaguez in the Puerto Rican Winter League, which just got underway on Thursday. Two other logical possibilities for protection are outfielder Zach Daeges and pitcher Jason Rice. Daeges, a sixth-round pick in 2006, missed most of the 2009 season with an ankle injury, but put up a .307/.412/.454 line for Portland in 2008. Rice, selected by Boston in the Triple-A phase of the 2008 Rule 5 Draft, impressed in 2009, putting up a 2.44 ERA and a 1.13 WHIP with 94 strikeouts in 70 innings for High-A Salem. The 23-year-old righty gets his fastball up to the mid-90s. Because injured fourth outfielders and high-velocity relievers are among the prototypical Rule 5 picks, both players could be in danger of selection if left unprotected this off-season. Other than the five players discussed above, it seems unlikely that any of the other players in the system will be protected this year, but one never knows, as the Sox have pulled a few surprises in recent off-seasons. Potentially unprotected Sox players who other teams may be willing to take a flyer on include pitchers Randor Bierd, Kason Gabbard, TJ Large, Bryce Cox, Kris Johnson, and Armando Zerpa, and outfielder Bubba Bell. Ultimately, we’ll get to see who the Sox opt to protect on Friday. The Mesa Solar Sox were quieted by a 15-hit attack and superb pitching from the Phoenix Desert Dogs, falling 11-1 on Monday afternoon. Mesa would jump out to an early 1-0 lead in the bottom of the first, as Bryan Peterson (FLA) reached on an error and scored on Chris Parmelee's (MIN) RBI single. Phoenix would answer back in the top of the third off of Mesa starter Randor Bierd. Darin Mastroianni (TOR) led off the inning with a single and scored on Danny Espinosa's (WAS) RBI triple, knotting the score at 1-1. The Desert Dogs then turned the game into a blowout in the top of the fourth as Bierd got two quick outs, but would not make it out of the inning. Adam Loewen (TOR) and Mastroianni hit consecutive singles, Matt Angle (BAL) walked and Espinoza drove in two with an RBI single. Corey Brown (OAK) continued the hit parade with a 2-RBI double, Grant Desme (OAK) walked, and Josh Bell (BAL) hit a line-drive three-run home run to cap the scoring. The seven-run inning put the Desert Dogs up 8-1. Bierd ended up going 3.2 innings and picking up the loss, allowing 4 runs on 7 hits, walking 2 and striking out 4. Phoenix added three more runs in the top of the fifth on RBI singles by Loewen and Angle and a sacrifice fly by Espinoza. Casey Kelly played third base and went 0 for 4 with 2 strikeouts, while Ryan Kalish went 1 for 4 with a double, Luis Exposito went 2 for 3 with a double, and Jose Iglesias went 0 for 4. The Solar Sox look to bounce back this afternoon as they face the Surprise Rafters at 2:35 EST. Felix Doubront (Navegantes del Magallanes) made one start on November 14 against Zulia, going 4.0 innings, allowing 3 hits, walking 2 and striking out 1. Enrique Gonzalez (Tiburones de La Guaira, pictured) started November 13, also against Zulia, going 7.0 innings to pick up the win, allowing 4 hits, 1 run and 2 walks. Yeiper Castillo (Aguilas del Zulia) made two appearances out of the bullpen, pitching 1.1 innings allowing 3 hits and 3 runs. Juan Apodaca (Aguilas del Zulia, pictured) went 0 for 3 in his lone appearance this week. Robert Coello (Algodoneros de Guasave) made the start on November 12, picking up the win by going 5.2 innings, allowing no runs on 3 hits while striking out 3 and walking 3. Angel Chavez (Caneros de los Mochis) appeared in five games, going 2 for 17 with 3 RBI. Aaron Bates (Caguas) went 1 for 8 in three games. Jorge Jimenez (Mayaguez) was 2 for 7 with a home run, a run scored and 2 RBI in 2 games. Iggy Suarez (Ponce) went 1 for 5 with an RBI in three games. Jose Vaquedano (Ponce) made two relief appearances, going 0.2 innings, allowing two walks and recording a strikeout. Player of the Week: Enrique Gonzalez, who had a sparkling start against Zulia in which he picked up the win while going 7.0 innings, allowing 1 run on 4 hits. 11/15 Cup of Coffee: After dropping a pair of games to Phoenix, Mesa got back on track Saturday with a 4-2 win over the Peoria Javelinas. Meanwhile Phoenix, behind Nationals prospect Stephen Strasburg, blanked the Saguaros 1-0 to narrow its magic number to one for clinching the Eastern Division crown. With four games remaining, the Desert Dogs hold a 3.5 game lead over the Solar Sox. Mesa took an early lead in this game, scoring a single run in the second on a Chris Parmelee (MIN) home run. However, the Solar Sox gave it right back in the bottom half of the inning, when Tiger prospect Cale Iorg hit a two-run home run off Mesa starter Tommy Mendoza (LAA). Mesa regained the lead for good in the third, scoring three times. Starlin Castro (CHC) led off the inning with a double and scored on a Parmelee double. Josh Vitters (CHC) then hit a two-run home run off Javelina starter Nick Hill (SEA) to complete the Solar Sox scoring. The game then became a pitcher's battle, with neither team scoring over the final six innings. Dustin Richardson, credited with a hold, entered the game in the eighth and pitched a scoreless frame. He allowed 2 walks while striking out 2 Javelina batters. Minnesota prospect Alex Burnett earned his third save of the fall campaign, retiring the Javelinas in order in the ninth. Luis Exposito went 2 for 5 in the game and is now hitting .295 with an OPS of .750. The Solar Sox's next game is Monday with a 2:35 pm EST start against Phoenix. 11/14 Cup of Coffee: With less than a week remaining in the schedule, Phoenix extended its lead over Mesa to 3.5 games with a 9-7 come-from-behind win on Friday. The team committed three errors, which allowed three unearned runs to score in the game. The Solar Sox struck first, when Marlins prospect Bryan Peterson led off the game with a triple and scored on a Rene Tosoni (MIN) single. The Desert Dogs answered back with three runs in their half of the first. After giving up two walks and an infield single to load the bases, Mesa starter Andrew Miller (FLA) watched one run score on a passed ball, allowed another on a Josh Bell (LAD) single, and third on Nevin Ashley's (TB) ground out. In the second, the Solar Sox tied the score, scoring twice on singles by Ryan Kalish, Steve Singleton (MIN), Casey Kelly, and Peterson. Phoenix answered with a single run in its half of the inning to regain the lead. In the third, Mesa scored its final four runs of the game. After singles by Chris Parmelee (MIN) and Kalish, Singleton hit a three-run homer. With two out, Peterson tripled for the second time in the game and scored on a Jose Iglesias single. The Desert Dogs scored once in the bottom of the inning, when Bell reached base on a Kelly error and scored on a Brad Emaus (TOR) double. Phoenix tied the score in the fourth on a two-run home run by Oakland prospect Brad Desme. The game remained tied until the bottom of the eighth. Chris Province, who had retired the Desert Dogs in order in the seventh, gave up a single to Darin Mastroianni (TOR) followed by a home run to Jemile Weeks (OAK). Reliever Eddie Gamboa (BAL) retired the Solar Sox in order in the ninth to record the save. Kalish went 2 for 3 with a walk and scored 2 runs. Iglesias went 2 for 5 with a RBI. Kelly, playing third, went 1 for 4 with a RBI. Province, in his 2 innings of work, allowed 2 runs on 2 hits. The Solar Sox play an 8:35 pm EST game today against the Peoria Javelinas. Player of the Night: Ryan Kalish, who had 2 hits, a walk, and scored 2 runs. 11/13 Cup of Coffee: Mesa had its six game winning streak halted, as Phoenix downed the Solar Sox 11-5. The Desert Dogs took the lead in the top of the first inning, scoring twice on a two-run homer by Oakland prospect Corey Brown. The Solar Sox cut the lead in half in the bottom of the inning, when Starlin Castro (CHC) doubled and scored on a Josh Vitters (CHC) single. In the bottom of the second, Mesa scored three times to extend its lead. With one out, Luis Exposito, Greg Burns (FLA) and Jose Iglesias all singled, loading the bases. Exposito scored on an error by Desert Dog outfielder and Blue Jay prospect Adam Loewen. Castro then drove in Burns with an infield single. After Iglesias was out on a force play at home, Vitters was hit by a pitch, scoring the third run of the inning. The Solar Sox held the lead until the fifth inning, when Phoenix scored three runs off of Angel prospect Jeremy Haynes. The three runs scored courtesy off three walks, two wild pitches, a single and a sacrifice fly. Exposito had two passed balls in the inning. The Desert Dogs added another run in the sixth off Tim Kiely (LAA). He allowed two walks and a run-scoring single to Brown. Richie Lentz came into the game in the seventh and allowed two runs on a single by Brad Emaus (TOR), a triple to Tampa Bay prospect Nevin Ashley, and a single to Loewen. The Solar Sox scored their final run of the game in the bottom of the seventh. With one out, Ryan Kalish singled to right and scored on a PJ Phillips (LAA) double. The Desert Dogs scored three more runs in the eighth on four straight singles to close out the game's scoring. Kalish and Exposito each went 1 for 4 with a run scored and a walk. Iglesias went 2 for 4 with a double. Lentz, in his one inning of work, gave up 2 runs on 3 hits. The Solar Sox play Phoenix again this afternoon at 2:35 EST. Boston cleared up another spot on its 40-man roster earlier this week by outrighting righthander Miguel Gonzalez to Pawtucket. Gonzalez, 25, was selected from the Angels in the 2008 Rule 5 Draft. The pitcher then injured his arm in spring training, ultimately resulting in March 2009 Tommy John Surgery. He spent the entire 2009 season on Boston's 60-day disabled list. Pursuant to Major League Rule 6, the Red Sox were required to offer Gonzalez back to Los Angeles for half of the Rule 5 posting fee ($25,000) before they could outright him to Pawtucket, as he did not spend the requisite time on the active roster in 2009. The Angels apparently did not bite, ultimately allowing the Sox to assign him to Pawtucket free of any roster restrictions. Gonzalez throws a decent low-90s fastball with excellent command, as well as a slider and a change-up. He also missed all of the 2008 season with a knee injury, but impressed in the Mexican Pacific League in the 2008-2009 off-season. Look for him to move slowly through the system in 2010, perhaps starting in Extended Spring Training followed by a promotion to Portland or Pawtucket. Jose Iglesias's two-out walk-off single propelled the Mesa Solar Sox to victory over the Surprise Rafters, 9-8. Surprise jumped out to a quick 2-0 lead in the first inning on an Ike Davis (NYM) 2-RBI double, and tacked on two more in the top of the third on Davis's two-run home-run. Mesa would get on the board in the bottom half of the third when Iglesias led off the inning with a single and came around to score on Hank Conger's (LAA) sacrifice fly. Iglesias again started a rally in the bottom of the fifth, as he led off the inning with a walk and promptly stole second base, scoring on Rene Tosoni's (MIN) RBI triple. David Cooper (TOR) knocked Tosoni in with an RBI double, Conger walked, and Ryan Kalish capped the scoring by hitting a three-run home-run. The five-run outburst gave the Solar Sox a 6-4 lead. Mesa would tack on two more runs in the bottom of the seventh as Josh Vitters (CHC) and Iglesias both laced RBI singles, making the score 8-4. Dustin Richardson came in to pitch the top of the eighth but had a rough outing as Doug Hogan (TEX) hit a two-run home-run, one of three Rafter hits in the inning. An inning later, Brandon Laird's (NYY) two-run home-run knotted the score at 8-8 in the top of the ninth, but the Mesa Red Sox contingent was not about to let this game slip away. Kalish opened the bottom half of the inning with a walk, then Casey Kelly singled, moving Kalish into scoring position. Iglesias eventually hit a two-out single that scored Kalish with the winning run. Iglesias was 4 for 4 with 2 runs scored, a double, and 2 RBI as the Mesa shortstop, and Kelly was 2 for 5 while playing third base. Kalish was 2 for 4 with 2 runs scored and 3 RBI. Richardson pitched 1.0 inning, allowing 3 hits (1 home run) and 2 runs, striking out 1 and walking 1, bring his ERA to 6.52. Mesa plays the division-leading Phoenix Desert Dogs tonight at 8:35 EST. Player of the Night: Jose Iglesias, who was a thorn in the Rafters' side, going 4 for 4 with 2 runs scored, a double, 2 RBI, a stolen base, and a walk-off RBI single to give the Solar Sox the victory. Jason Varitek will be returning for his fourteenth season in a Boston uniform, after picking up his $3 million player option for 2010. Varitek will be serving as the back-up catcher to Victor Martinez, who took over starting duties upon his arrival from Cleveland. The Red Sox declined Varitek's $5 million team option on Monday. I recently had the opportunity to exchange some questions and answers with Craig Shipley, Red Sox Senior Vice President/International Scouting. A veteran of eleven seasons as a major league infielder, Shipley became the second native Australian to play in the majors when he made his major league debut with the Dodgers in 1986. He went on to play for the Mets, Padres, Astros, and Angels, hitting .271 in 582 career games. Shipley began his baseball operations career as an infield and base running coordinator for the Montreal Expos in 2000. He later served as a professional scout for the San Diego Padres, and then joined the Red Sox organization on December 7, 2002. He has been the head of Boston's international scouting department since 2006m and the Sox have brought aboard a slew of international talent under his watch, including Daisuke Matsuzaka, Hideki Okajima, Stolmy Pimentel, Michael Almanzar, Junichi Tazawa, and most recently Jose Iglesias. Shipley is also a veteran of the College World Series, having played for the University of Alabama club that lost to Roger Clemens and the Texas Longhorns in the 1983 championship game. Many thanks to Craig for taking the time to answer our questions. Mike Andrews: As the Senior Vice President/International Scouting, can you briefly describe to us what your job entails? I'm guessing you rack up a lot of frequent flyer miles. Craig Shipley: My responsibilities are to oversee all aspects of the department including scouting, administration, and budget. I have daily interaction with our Latin, Pacific Rim, and European coordinators, and spend significant time on the road with the country supervisors and our area scouts. My year is usually spent from November to June scouting Latin America, July to October in and out of Asia, with Europe mixed in when necessary throughout the year. MA: In recent years, the Red Sox have signed players out of Brazil, Aruba, the Netherlands, Germany, Curacao, and Cook Islands Maori. How does the international scouting department identify talent from non-traditional baseball countries, and how does the difference in baseball culture affect the scouting and negotiation process with players from such areas? For example, just how appealing is a deal with the Boston Red Sox to a player from Brazil? CS: The evaluating process is very similar wherever we go. Our scouts look for projectable players following the protocols we have in place. In the case of Brazil, Fernando Tamayo made the initial contacts, then he and Mike Lord went down on an extended trip early in 2009. We always make contact in developing markets before we go in and usually come away with one solid contact person for future trips. Negotiation is the same in Latin countries - meaning we deal with an agent or buscon and in some cases both. Japan, Korea, and Taiwan all have agreements with Major League Baseball - when engaging a player in these countries the agreement protocols have to be followed. In the case of Taiwan and Korea, military obligations make the negotiation process a little different from the rest of the world. The Red Sox brand is very visible in all parts of the baseball playing world. How appealing we are to a player depends on many factors, but in most cases the determining factor to where a player signs is the money. MA: Jason McLeod recently commented that "ascertaining the makeup of a player is one of the hardest things - if not the hardest thing - that we do as scouts." What steps does the international scouting department take to get to know the highly-regarded international amateurs, such as Jose Vinicio, before offering them big bonuses? CS: Jason and I have discussed this many times, it’s the hardest thing to determine. I think that experienced evaluators usually have the best chance of determining “makeup.” There are so many components to a good baseball personality. The fundamental necessities for me are a great love for the game and a burning desire to play in the major leagues. All players will face adversity, how they handle it determines to a large degree their chances of getting to the majors. If they don’t have the aforementioned necessities as part of their “makeup”, the chances of them giving up the pursuit when they face adversity are exponentially greater. To determine the personality of a player, we spend as much time as possible in one-on-one interaction, we also watch carefully from a distance. How the player interacts with teammates and coaches when we are not involved in the interaction, as well as how he reacts to circumstances on and off the field, are factored. Determining a player's personality should ultimately fall on the identifying scout, and in that regard we place a tremendous emphasis on the scout knowing the payer he is recommending. In most cases the international cross checker is able to spend a lot more time around players than a domestic cross checker, enabling us to get more than one scout involved in the “makeup” process. MA: I've noticed a trend of the Sox signing international players in pairs - Daisuke Matsuzaka and Hideki Okajima, Boss Moanaroa and Moko Moanaroa, Terumasa Matsuo and Hayato Doue, Xander and Jair Bogaerts, and Chih-Hsien Chiang and Chih-Hsiang Huang. Is this an intentional strategy to provide for a more comfortable transition to the States, or is it simply a coincidence? CS: Okajima's signing was independent of Daisuke’s. Other than that, in some cases it’s a coincidence, and in some it's by design. Having a player you know when entering a foreign environment can only help. MA: To what extent do you stay involved with the international players after they have signed? CS: I am heavily involved in their placement through the lower levels of our system, but once they’re established in our system and begin moving up, the need for me to be involved is much less. I follow the development of all the players we sign on a daily basis. MA: All early reports have raved about Jose Igelesias' defense. Can you discuss your take on his present and potential offensive abilities? CS: Cuba does a lot of things very well when developing players. One that stands out is allowing a player to be himself while teaching important fundamentals. Jose left Cuba with fundamental components that should allow him to be a good hitter. Now he’s in an environment with a lot more structure, most of it foreign to him, but he’s very intelligent and I envision him adapting well. That said, his development will take time. His offensive ability will ultimately be determined by several factors, including strike zone management and his understanding of his own swing. MA: Oscar Perez is another player that has drawn excellent defensive reviews. What are your thoughts on his potential? CS: Oscar is progressing nicely. He has a great personality and desire to work. His defensive skills are continually improving, along with his approach at the plate. I saw him in the Instructional League, and last week in Venezuela. He looked good behind the plate with improving feet, exchange, and arm strength. MA: The Sox recently signed a couple of Dominican prospects that the fan base doesn't know a whole lot about. What can you tell us about Raul and Mario Alcantara? CS: Both are projectable righties who fit the mold of what we look for in starting pitchers. They will both pitch in the DSL in 2010. MA: In a similar vein, what can your share with us regarding Jair and Xander Bogaerts? CS: Jair is very strong - he is crude behind the plate with very strong hands and raw power. I envision Rob Leary being able to impact him quickly in regards to his receiving. Xander is very athletic and projectable. He has potential on both sides of the ball. Both of these guys love to play. MA: You have signed three players out of Europe since 2007 - Raoell Kortstam, Jennel Hudson, and Swen Huijer, and were reportedly in on Max Kepler, the top European prospect in 2009. How far along is the amateur talent in Europe compared to other areas of the world with longer baseball traditions? CS: Select countries in Europe, including Germany and Holland, actually have a long history of playing the game. The baseball communities in these countries are very passionate. The overall talent pool is developing, but like most countries or regions, the amount of talent is dictated by the number of participants. The pool of participants is growing, and the instruction is fair-to-good, ultimately giving the overall talent there the tools to improve. The Mesa Solar Sox continued their ascent in the AFL Eastern Division standings, winning their fifth straight game by a 6-4 score over the Surprise Rafters. The victory places Mesa only 1.5 games back of division leader Phoenix. The Solar Sox wasted no time getting on the board, as Bryan Peterson (FLA) hit the third pitch of the game for a lead-off home run. The Rafters would answer back in the bottom of the first off of Mesa starter Randor Bierd. Back-to-back hits by Jarrod Dyson (KCR) and Daniel Descalso (STL) put runners on second and third for Brandon Laird (NYY), whose groundout knocked in Dyson to knot the score at 1-1. Mesa would explode for five runs in the top of the fourth to give the team an advantage it would never relinquish. Matt Dominguez (FLA) lead off the inning with a double and was replaced by pinch runner Steve Singleton (MIN). P.J. Phillips (LAA) was the next to reach when Laird muffed a throw from third baseman Mike Moustakas (KCR), allowing Singleton to score. Michael Brenly (CHC) then knocked a single off of pitcher Mike Parisi (STL), and Ryan Mount (LAA) followed with a single that deflected off of second baseman Descalso which scored Brenly for Mesa's third run. Mount promptly stole second and Greg Burns (FLA) walked, which allowed Peterson to clear the bases on his sixth double of the AFL season and give the Solar Sox a commanding 6-1 lead. The Rafters tacked on a run in the bottom half of the fourth as Colin Curtis (NYY) hit a lead-off double and moved to third on a wild pitch. He scored when Daryl Jones (STL) grounded out to first. The score stood at 6-2 and signaled the end of Bierd's day. He pitched 4.0 innings allowing 2 runs on 6 hits walking 1 and striking out 1 to pick up his third win. Surprise would add two more runs in the bottom of the fifth on a sacrifice fly by Moustaskas and an RBI single by Curtis, but it wasn't enough to overcome the deficit. Richie Lentz earned his third hold of the fall campaign by pitching a scoreless seventh inning to lower his ERA to 0.71. The Solar Sox play these same Surprise Rafters this afternoon at 2:35 EST. Player of the Night: Randor Bierd, who picked up his team-leading third victory by pitching 4.0 innings allowing 2 runs. The Red Sox have purchased the contract of righthander Stephen Fox from the Sussex Skyhawks of the Can-Am league. Fox posted a 3.98 ERA in 19 games out of the bullpen for Sussex this season. He was especially effective late in the year, putting up a 1.90 ERA and recording 29 strikeouts over his final 24.0 innings after making mechanical adjustments. Fox was recruited to play baseball at Hofstra out of high school but never gained eligibility. He pitched in a non-professional men's league before being signed by Sussex. He was ranked the ninth-best Independent League prospect by Baseball America in October. 11/10 Cup of Coffee: It was a close one in the desert Monday, but timely hitting and a stellar ensemble pitching performance helped Mesa edge Scottsdale by a 3-2 score. The Scorpions got off to a fast start, scoring in the first when Brandon Crawford (SFG) doubled with one out and scored two batters later on an RBI groundout by fellow Giants prospect Thomas Neal. Hector Gomez (COL) added to the lead in the third when he homered against Marco Albano (LAA), who had just entered the game for starter Tim Kiely (LAA), to lead off the inning. With the score still 2-0 in favor of Scottsdale in the bottom of the fifth, Mesa started its comeback. After a lead-off single by David Cooper (TOR) and a fielders-choice groundout by Ryan Kalish, Steve Singleton (MIN) tied the game with a two-run home run to right, scoring Kalish. The Solar Sox would take the lead an inning later thanks in large part to the speed of Starlin Castro (CHC), who led off the inning with a single, stole second, advanced to third on a fly out by Rene Tosoni (MIN), and scored on a sacrifice fly by Chris Parmelee (MIN) to make the score 3-2. The Mesa bullpen would handle things from there, shutting out Scottsdale over the final 7.0 innings following the Gomez home run. After Albano departed at the start of the fifth inning, Florida prospects Jay Voss and Jay Buente each tossed 2.0 scoreless frames. Chris Province then closed the game out in the ninth, allowing only 1 hit to earn his second save of the AFL season. Kalish, who patrolled center field for Mesa in this game, went 0 for 3 with 2 strikeouts, but did gun down Buster Posey (SFG) at second base to turn a fly out to center into a double play. Jose Iglesias also saw action in this one, going 0 for 3. Mesa returns to action this afternoon at 2:35 EST when the team squares off against Surprise. Player of the Night: Chris Province, who preserved a one-run lead with a scoreless inning to earn his second AFL save. The Red Sox yesterday made decisions on their team options, choosing to decline their $5 million option on Jason Varitek, as well as their $6 million option on Alex Gonzalez. The team also picked up its $7.1 million option on Victor Martinez while coming to terms on a new deal with Tim Wakefield. Varitek struggled last season, hitting .209 before eventually losing his starting job to Martinez. His days with the Red Sox may not be over, as he holds a $3 million player option that includes an additional $2 million in incentives. Gonzalez was paid a $500,000 buyout instead of having his option picked up. He was acquired by Boston on August 14 and hit .284, making just one error in 44 games. The team is reportedly exploring bringing back Gonzalez at a lower price. Martinez was acquired at the July 31 trade deadline and made an immediate impact on a struggling Red Sox offense. He hit .336 with 8 home runs and 41 RBI in 56 games with Boston, taking over the starting catcher position from Varitek. The Red Sox and Wakefield came to terms on a new two-year deal instead of his perpetual $4 million option. Wakefield will make $3.5 million in 2010 and $1.5 million in 2011. The contract also contains performance-based incentives which can reportedly make the deal worth $10 million over two years. Wakefield made his first American League All-Star Team last year, but struggled with injuries and ended up only making 21 appearances, the lowest number he has made since his rookie season in 1992 with Pittsburgh. Jose Alvarez (Caribes de Anzoategui), in his last appearance before being traded to Florida, threw 2.2 innings out of the bullpen on November 4, allowing 2 runs on 2 hits while walking 2 and striking out 2. Felix Doubront (Navegantes del Magallanes) made two appearances (one start) in which he pitched 4.1 innings, allowing 1 run on 2 hits. He did not record a strikeout or a walk in either appearance. Enrique Gonzalez (Tiburones de La Guaira) started November 6, going 4.1 innings allowing 5 runs on 7 hits (2 home runs), while walking 1 and striking out 2. Leandro Marin (Leones del Caracas) made one appearance, pitching a clean outing out of the bullpen on November 6 against Lara in which he picked up the win while recording 2 strikeouts. Yeiper Castillo (Aguilas del Zulia) made three appearances out of the bullpen, pitching 2.2 scoreless innings allowing only 1 hit. Juan Apodaca (Aguilas del Zulia, pictured) went 4 for 11 with 4 RBI in five appearances during the week. Robert Coello (Algodoneros de Guasave) made the start on November 6 against Culiacan, picking up the win by going 5.0 innings, allowing 1 run on 5 hits (1 home run) while striking out 3 and walking 2. Angel Chavez (Caneros de los Mochis) appeared in three games, going 0 for 8 with an RBI. Mark Wagner (Gigantes del Cibao) played in two games, going 1 for 8 with a single. Reynaldo Rodriguez (Leones de Monteria) appeared in seven games, going 7 for 27 (.259) with 3 doubles and 2 RBI. Player of the Week: Juan Apodaca, who hit .363 with 4 RBI in five games for Zulia. 11/8 Cup of Coffee: Trailing 7-0 after the top of the first, the Western Division held the Eastern squad scoreless for the remainder of the game and rallied for a dramatic come-from-behind 8-7 win in the AFL Rising Star Showcase. Before 4,550 fans, the largest crowd in the game's brief history, the Eastern Division scored seven times in their half of the first, driving Atlanta prospect Mike Minor from the game after retiring just two batters. Eleven Eastern hitters came to bat in the inning, producing the 7 runs on 7 hits highlighted by a three-run home run by Arizona prospect Brandon Allen. Two Red Sox prospects entered the game in the bottom of the fifth. Dustin Richardson came into the game in relief, while Jose Iglesias entered as a defensive replacement at shortstop and ended up going 0 for 2. He struck out swinging in the sixth and was called out on strikes in the eighth. After retiring the first two hitters on a ground out to short and a strikeout, Richardson gave up two straight singles before getting the final out of the inning on a fly ball to deep center. The East held on to its narrow one-run lead until the bottom of the eighth. Padre prospect Lance Zawadzki led off the inning with a single. Cleveland catching prospect Mike McBride followed with a two-run homer to complete the comeback. Allen led off the ninth with a walk for the East but Braves prospect Craig Kimbrel retired the next three hitters to earn the save for the Western Division. The Solar Sox resume play on Monday with a 2:35 EST game against Scottsdale.